2nd. Encounter is made for the Retro Remakers Competition 2006. This version is a remake of the game Encounter! 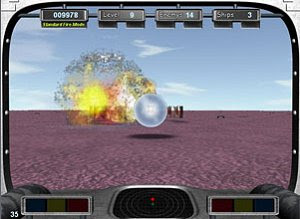 The original game by Paul Woakes was published in 1984 by Novagen Software. You landed on a planet where some aliens use robot bots for training. After your landing on the planet the training system automatically activates and your fight for survival begins.